My husband and I (both native Spanish speakers) are starting to talk to our 3 year old about his adoption story. We met his birth mom several times before my son’s birth, and she seemed to like the term ‘tummy mommy’. However, we typically talk to our son in Spanish, so we want to have a similar term we can use to talk about his birth mom in our native language. 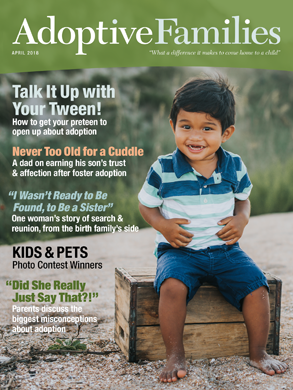 Does anyone speak to their children in Spanish about adoption? Can you share words you use to talk about the birth parents? I’m trying to avoid the equivalent of ‘biological mother’, which is the only thing I found when reading materials in Spanish. I am of no help Spanish wise but I never liked the term Tummy Mommy as the fetus isn’t in anyone’s tummy. My sister was 16 when I was born and married and pregnant when I was 5 I distinctly remember being told the baby was in her tummy and I was so upset that the chicken and stuff she was eating was hurting the baby. I guess birth mother is a fine word, that is who she is. Thank you Regina. The issue I see with a 3 year old is that they do no seem to understand the birth part yet, but they see pregnant women and they understand babies grow in women’s ‘tummies’. I guess the next question is how to tell a 3 year old about how babies get out of there! When I shared for the first time my son’s adoption story, I kept it simple. As you know, some phrases in English do not translate well into Spanish. I would just use a short phrase, “tu mama de barriga” o “la chica que te tuvo en su barriga”. In our case, I introduced her by her name, example, Maria, la chica que te tuve en su barriga”. We referred to our birthmother by her first name. Find a phrase easy enough for your 3 year old to understand and that you guys as parents feel comfortable. We still use the term birth mother, although I think mama de barriga” works fine for now. My kids know their birth moms’ names, but usually refer to them as “birth mom”. Thank you all, and especially for the tip about distinguishing a women’s tummy from the special place women have for babies (I like that!). We were also planning on using his birth mom’s first name, so that will help. I would recommend finding some kind of children’s book that relates to a person losing someone for the interest of the other person. Having a visual can help children understand situations and they can also compare their life with the storybook as well as make their own conclusions until they are old enough to really understand the process.